With a glut of oranges (read over flowing fruit bowl) and a rapidly depleting store of marmalade I felt the urgent need to get preserving. I love preserving, it’s a very cathartic, soothing activity. Regular readers will have come to understand just how much I love preserving but for those of you who would like a reminder or are new readers have a look here. Preserving isn’t an activity all that easy with an almost 9 week old Italian Spinone puppy by the name of Maximus running around your feet, nosing into everything and generally being a cheeky little pup, requiring you to have eyes in the back of your head. Sure he looks innocent and sweet enough but let food be smelt and the jumping and yodelling (yes yodelling not typical barking) will commence. Certainly not soothing I’m sure you’ll agree, and then the whole kitchen activity becomes fraught and wracked with anxiety. I settled on a marmalade that requires no cooking. No cook marmalade? How can that be so? Doesn’t marmalade need time, effort and hot pans to be slaved over? All those thoughts went through my head when I noticed @aforkful over on Twitter discussing her latest marmalade, a no cook version which you can read about here. 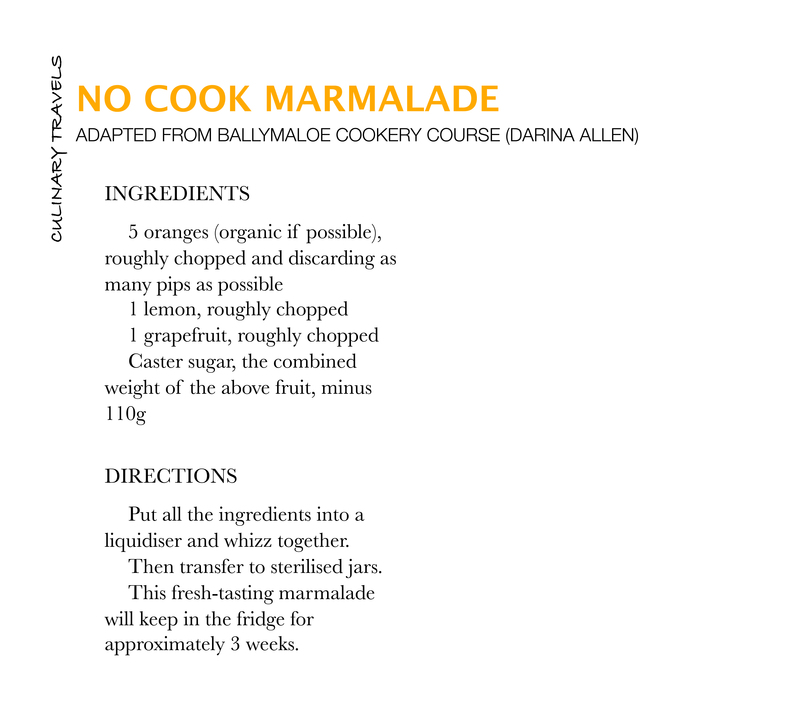 For conventional marmalade yes, preserving pans and thermometers galore are required, not that is in any way a bad thing, but for this gem of a recipe from Darina Allen, (of the esteemed Ballymaloe cookery school in Cork, and author of many excellent books; including Ballymaloe Cookery Course, from which this recipe comes) you need nothing more than a sharp knife, blender or food processor and a few sterilised jam jars. Whether this is truly a ‘marmalade’ or not is a matter of debate. I feel it should be named a citrus spread rather than a marmalade. Why? Well the word marmalade derives from the Portuguese word marmelada which actually was a cooked down quince paste; and hence I feel marmalade refers to a cooked product, but hey, whatever it is called, the result is the same – a gorgeous spread. Conventional marmalades can have a rather bitter edge to them, whereas this one doesn’t. It is bursting with citrus tang with an almost sherbet sweet edge, a real winner. Find out you’ve run out of marmalade of a morning to have with your toast, well you could have this rustled up in a jiffy, go on trust me.